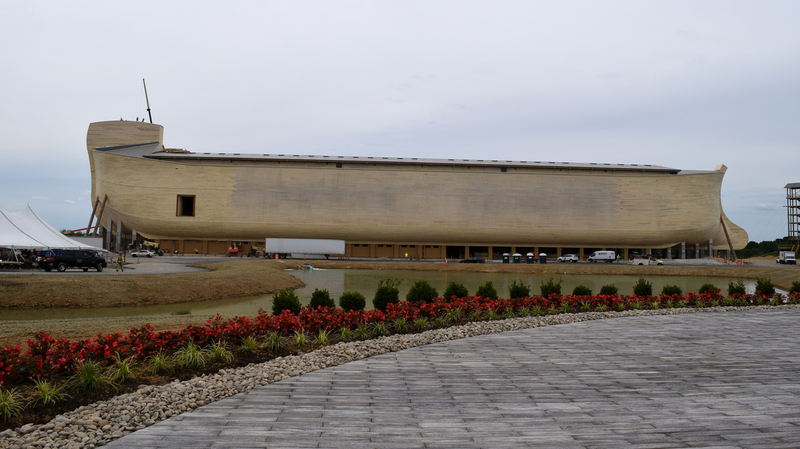 Life-Size Noah's Ark To Open Amid A Flood Of Skepticism The replica opens in Williamstown, Ky., this week. The group behind Ark Encounter and many local officials say it will be an economic boon to the area, but some locals are skeptical. The Ark Encounter is slated to open in Williamstown, Ky., on Thursday, July 7, a nod to Genesis 7:7, which tells the story of Noah and his family entering the ark. A replica of Noah's Ark has been built in the rolling hills of northern Kentucky and it is, quite literally, of biblical proportions. The wood structure stands seven stories high and is the length of 1 1/2 football fields. "The Bible indicates the original Ark was 300 cubits, using the Hebrew royal cubit that calculates in modern-day terms to 510 feet long," says Mark Looey, a co-founder of Answers in Genesis, the Christian ministry that built the attraction. It's the same group that opened the Creation Museum in 2007 in Petersburg, Ky., which promotes a literal interpretation of the Bible and other teachings: that planet Earth is only 6,000 years old and that man lived alongside dinosaurs. The ark attraction has been mired in controversy for years, and though Answers in Genesis promises jobs and increased tourism to a region in desperate need of an economic boost, for many who live there, it's very much a mixed blessing. The ark offers three decks of exhibits so sophisticated, you might think you stepped into Disney World. There are no live animals on the ark, though. "There's a zoo out back for them," Looey says. Instead, the ark will be filled with lifelike models of animals — including dinosaurs and a pair of unicorns — designed by many of the people who also made exhibits for the Creation Museum. The ark doesn't float either. Ken Ham, Answers in Genesis and Ark Encounter president and CEO, says it wasn't built to float. "We built it as a reminder, a reminder in regard to God's word and the account of Noah and the flood," he says. It cost $100 million to build and is expected to draw up to 2 million visitors a year along with millions in tourism revenue, according to what the ministry calls an independent study. Looey says they've already hired over 300 staff and hundreds more jobs are on the way when the other phases — including a walled city and a replica of the Tower of Babel — are completed. Many in Williamstown, Ky., the small town that sits right across Interstate 75 from the attraction, are waiting for it to open with bated breath. 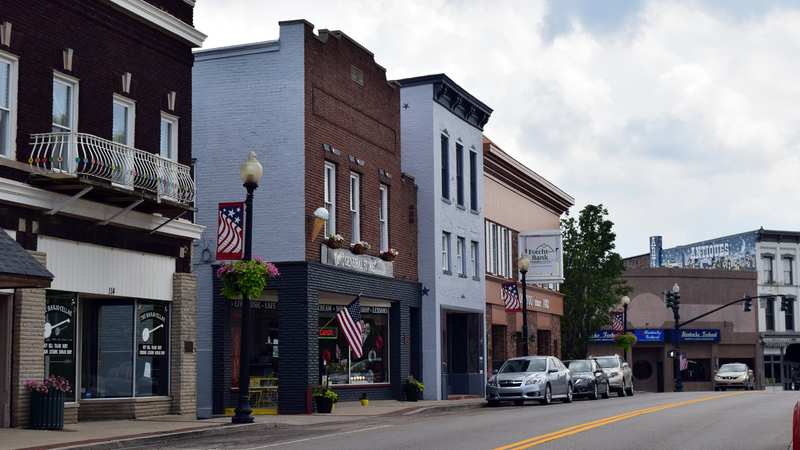 The town — the rural seat of Grant County, Ky., — has a population of about 4,000. It's a middle-class bedroom community right between Cincinnati and Lexington, Ky.
Williamstown Mayor Rick Skinner, an enthusiastic supporter of the attraction, says the town has already upgraded its electricity and built a new water treatment plant. Downtown is also getting a face-lift. On Main Street, many new stores have already opened up while others are in the process of being renovated. Before news of the Ark Encounter coming to town, the old brick buildings that lined Main Street were mostly vacant. News of the Ark Encounter has sparked a rehab of the old brick buildings on Main Street in Williamstown, Ky.
Local lawyer Bill Adkins says when the recession hit Williamstown, it hit hard. He remembers sitting in foreclosure settlements almost every week. According to the study cited by Answers in Genesis, the ark's economic impact will be about $4 billion over the next decade. But Adkins is skeptical. "We've not seen the hotels, we've not seen the restaurants coming in to support this attraction," he says. "I think a lot of people are waiting to invest because they want to see if after the flash and bang of the opening, what happens next." Answers in Genesis points to the success of the Creation Museum as proof of the ark's potential. The ministry says the museum gets 300,000 visitors a year and that its generated revenue has exceeded expectations, though they would not provide numbers. Then there are controversies around the project, provoking debate over separation of church and state. The state withdrew tax incentives it had awarded Answers in Genesis, in part, because the ministry refused to pledge that it would not discriminate on the basis of religion in its hiring. The state said the project had evolved from a tourism attraction to an extension of the ministry. The tax breaks were later reinstated after Answers in Genesis, which said it had the right to hire on the basis of religion, sued in federal court and won. Adkins is uncomfortable with the tax breaks worth up to $18 million the ministry is getting from the state. Answers in Genesis is considered a tax-exempt church and critics of the ark project have said that getting tax breaks amounts to "double dipping." 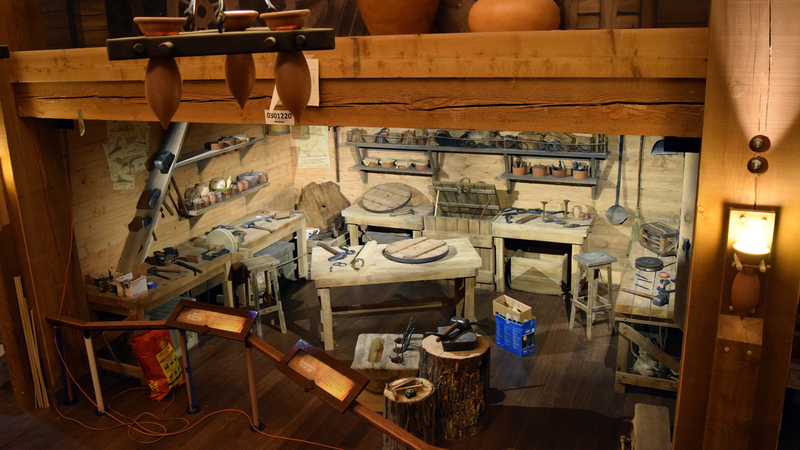 An exhibit showing an ancient workshop inside the Ark Encounter, a replica of Noah's Ark opening soon in northern Kentucky. It also just doesn't sit well with him that job applicants must adhere to the ministry's rigid moral code and belief system. "That one would have to subjugate their own beliefs to comply with that of an employer," he says, "that seems very intrusive and very oppressive to me. A federal judge earlier this year ruled that Answers in Genesis, as a religious group, has a right to restrict its hiring. Resident Jay Novarra is irked at local leaders. Along with providing the project with free land, Williamstown also gave Answers in Genesis $62 million in bonds. The ministry says the town will not be on the hook for those. As a farmer, Novarra is worried about the price of water going up since the town is also providing water to the ark. "We do have a lot of people who make a living farming and you start adding to the price we have to pay to raise our food, then you're definitely impacting farmers," she says. "And I have to ask myself: What is that farmer getting out of it?" Mayor Skinner says there is no contingency plan. They're putting all their eggs in one basket — kind of like Noah.